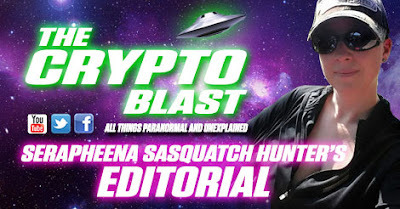 Meet Serapheena Sasquatch Hunter, she is our newest contributing editor to The Crypto Blast! I recently saw play out on Facebook a long commentary on the bias of most, if not all the Bigfoot academics and field researchers. 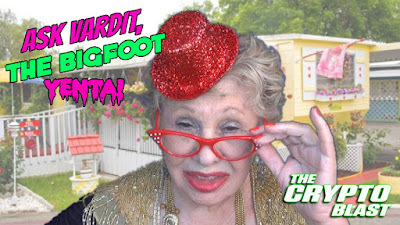 The commentary went on to say BF (Bigfoot) could not be a primate of any type and that had any of the researchers actually seen one, would know that to be a fact (FYI I just audibly sighed). 1) I have personally seen what I would term a BF and despite that encounter could not with ANY certainty; tell you how this animal (using the term loosely) would be scientifically classified. A visual sighting does not give me what I need for purposes of classification of a brand new species. It ONLY gives me the ability to theorize and compare and contract similarities with known species. It’s a complete fallacy to be able to state you KNOW what BF is or is not off a sighting, or even a group of sightings. There is zero science or credibility to that statement. I call that BF BS! 2) I can hypothesize any number of things about a BF based on encounters / experiences and data collected to date. No scientist, academic or field researcher worth their salt would speak in any absolutes about BF. We can form hypothesis based on current data and from that point work to prove / disprove current hypotheses and or create new ones. That being said, no blogger or commentary could or should speak in absolutes either for the same reason. To make any absolute about an unknown unclassified animal, again I call BF BS! 3) Bias…. We all have it. Not one person can ever claim they aren’t biased in some way. That’s life. We base many things on what we know, our experiences, our education, our social backgrounds, etc. The difference is how we let that bias affect our research. True science and the scientific process is about fluidity and evolution of ideas. What we know or believe to be true today, may change tomorrow. Just because academics wrote a book on a subject 10 years ago, doesn’t mean that their current thoughts, opinions and ideas haven’t morphed, changed, etc. Granted, most social media keyboard warriors or BF enthusiasts don’t benefit from knowing some of the top BF folks and don’t have the opportunity to listen to the fluidity of their research and ideas. So they just make assumptions. And you know what they say about assumptions…. Back to those social media key board warriors, opinionators, haters, skeptics, what I call “stalkarazi’s (like paparazzi) and fan folks…. It’s always easy to sit there and type away any amount of BF fluff. There are ample Facebook groups where you can delight away, fight away, express away.. etc. But the reality is, doing so is just FLUFF. Useless fluff. You won’t find most academics or researchers spending their personal time in those forums. They are too busy doing their thing out in the field, at conferences, working to collaborate with others in the field, set standards of research and yes, educating city folk on being safe in the woods at those so-called expeditions you like to make fun of. You won’t see me sit here and type about the failings of “Matt Moneymaker and his crew Larry, Curly and Mo” as one “commentator” wrote. I think he forgot that Finding Bigfoot is a reality TV show, designed to pull ratings and entertain an audience. But hey, keyboard warrior, it’s easier to say what they are doing wrong on their reality TV show, than lace up a pair of boots, put your blog away and spend hundreds of hours unplugged in the woods. I give great kudos to the likes of Derek Randles and the Olympic Project Team as well as groups they collaborate with like The Tillamook Forest Research Group. They walk the walk and exemplify the fluidity needed to make a hypothesis, change it, change it again, discuss opinions, ideas, plow through video and audio files, run experiments, educate the public AND do it while having fun *(BF foot note). What I love most about these folks …. they will debate amongst themselves what BF is, they never speak in absolutes, many are there because of personal encounters (yes, actually SEEN a BF!) and none let personal bias affect their work. On the contrary, they use their varied backgrounds to solidify the diversity amongst their team mates and benefit from it. Now, excuse me while I put my computer down and pack my bags. It’s Beachfoot time. Can’t wait to spend 4 days collaborating with the Who’s Who of the BF community. And I just may do it with a shot of Pendleton in my hand…..
Haters always gonna hate and jealousy is a monster for an entirely different debate.